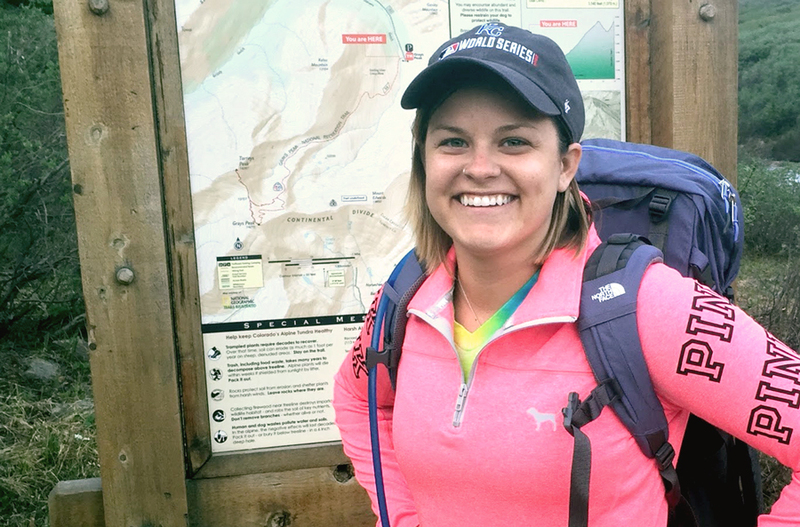 Samantha is a 24-year-old bilateral cochlear implant recipient bitten by the travel bug. She shares how her implant has enabled her to explore the world. Currently living in Texas, USA, Samantha works for a non-profit organization teaching children with sensory needs. My hearing journey is a short one. Just in the last 3 years, my family and I started to notice a decline in my understanding of speech and high-pitched sounds. One day in the summer, my mom, aunts, and I were sitting on the back porch chatting about how the cicadas were too loud and they couldn’t hear each other talking. I asked them “What noise?” It was then that we knew I had significant hearing loss—especially in the high decibels. I used hearing aids for about a year and when I went back in to get my hearing tested, the audiologist noticed a decline in my understanding of speech. My hearing had dropped about 40%, which shocked the doctors. After more hearing tests, I qualified for cochlear implants. Originally it was a very difficult decision. I didn’t know if my hearing would decline even more in another year and decided it was best to be proactive and go ahead with the implant which I got in February 2015. I was told the doctor would try to save my residual hearing, but when I woke up from my first surgery I felt “deaf”. After about 3 months of rehabilitation, I realized my hearing was much better and I started to feel better about my decision. After a year, I was shocked at how well I could understand the world around me, which made my second implant an easy decision. My parents, Tom and Cheryl, started traveling when they were working with the Air Force based in Germany. When I was in high school in the US, my mom’s job relocated her to Paris and each summer we would visit her. During her time in France I was able to visit 13 different countries and you could say the rest is history. My family and friends are extremely supportive. Traveling means I get to experience life on my own. I get to see another country and experience a different culture while learning everything I can about that country. Traveling with my implant is new for me—only in the last year and a half—but it has made me more confident when I am going through airport lines or being in the cabin of an airplane. Before having my implant, I was so anxious in these situations that I couldn’t hear what someone said or asked me. When I went on a cruise in March 2016, I felt nothing but excitement because I knew I wouldn’t miss any conversation or special sounds due to hearing loss. I find it most enjoyable to learn about someone else’s culture. With my cochlear implant, I love being able to have a full conversation without having to read someone’s lips the entire time! I also love hearing music. A standout memory for me was in Mexico this past March, I could walk in the streets and hear the music with no problems. That was truly an ecstatic emotion! Still, most loud restaurants are overwhelming to me because I still get that slight anxious feeling about hearing someone correctly and answering the question the right way. Since traveling with my implants I would have to say my favorite experience was when I visited Harry Potter World at Universal Studios Orlando last year. I was on cloud nine and overwhelmed by the smells and the sounds around me, but it was a good overwhelming situation. I could hear all of the rides and all of the park employees talking and I could enjoy conversation with other people who love Harry Potter as much as I do. My absolute favorite country is France and I am desperate to go back now that I have bilateral implants! I sometimes get asked questions about my cochlear implant, and I just quickly explain it helps me hear and then move onto another conversation about the new things we have learned while touring the country. I have often had people ask me if it will work for them too, because they or someone close to them have had hearing loss their whole life but had no idea what to do about it. Make sure you have enough batteries, or use the new rechargeable ones for SONNET. However, I have never found a drugstore that doesn’t carry the battery we need. I also take my drying kit and plug-in attachment if the country has a different one. I recommend having WaterWear if you plan on swimming or being near water. For me I swim a LOT! There are times that I choose to go without my ears, as I call them, because I am very worried about losing my equipment. For example, I wouldn’t suggest wearing them in rough water. If there is a situation where you’re having trouble understanding someone, just share that you are having a hard time hearing them. If there is something you hear that isn’t normal, ask someone what it is. I forget what some bugs or birds sound like and I find myself questioning other people if what I am hearing is the correct sound. Most importantly, remember to relax and enjoy the sounds around you! If you’re thinking about traveling, go for it! Don’t be afraid to get out there and enjoy the world. Others might have questions or opinions, but most people are curious and praise you for being strong and getting out there. My next travel plans are off to the Cayman Islands next year, again! This time, I will swim with the stingrays and go under water with my WaterWear! Getting to know new people? We share 14 tips for meeting new people when you have a cochlear implant! Liked this post? Subscribe to the MED-EL Blog by entering your email below to get recipient stories and tips and tricks sent to your inbox every week!